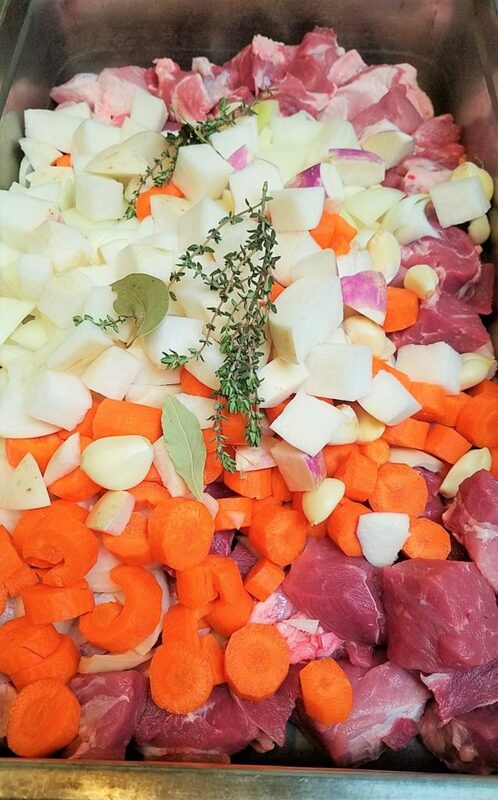 The ingredients for our rillettes de porc, served at both Le Pichet and Café Presse: Berkshire Farms pork shoulder, carrots, onions, garlic, thyme and bay leaf. Add fat (we use duck fat) and a lot of time slow cooking and the rillettes are almost finished. The cooked pork is mixed with the cooking fat, salt and spices, then cooled and cut. Miam Maim. This entry was posted in Stuff and tagged Charcuterie, pork, rillettes. Bookmark the permalink.